The display name project 365 of twitter has been keeping me busy and I had started ignoring this blog. Today, though, I have some interesting news. As of today, I'm officially a cooker. No no.. Not the pressure kind. The cooking kind. I mean, I have learnt to cook a few basic recipes that would help me NOT JUST survive, but help me retain sesnsation of my taste buds. Yes, I have not just learnt to cook/make the Tambrahm essentials of Molagapodi, Thenga podi and Dhaniya podi, but have also made my first prototype test and I'm pleased to announce that it has been a grand success. This post is part 1 of the series where I shall describe the procedure to what all I have made. Disclaimer: Follow the links if you aren't sure what these ingredients are. I have linked them to bigbasket.com from where I buy my groceries. I have no other association with them. About a Rs.5 coin sized piece of Perungaayam (Asafoetida/Hing), if you are using the solid kind. If you are using the powder, add about a tablespoon full. More if you like the smell of it. About a two-thumbs sized piece of vellam (jaggery) for a tinge of sweetness. Avoid it if you don't like sweetness. Personally, I feel this is what makes it taste brilliant. I have a sweet tooth, you see. I hadn't measured it in terms of weight. My Mom hates doing that. Everything is measured only by the eye. "You'll know how much is enough when you see it" is what she says and I seem to follow her. Okay, I've put up the image of the tumbler below if you still need measurements. 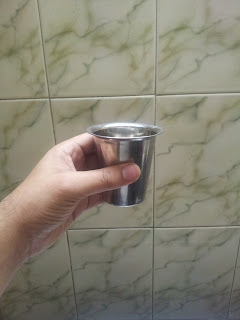 1 tumbler = approximately 150gm of Paruppu (Dhal). Not sure though. Take all the ingredients mentioned above, except the eLLu and fry it in a pan on medium flame with any oil that you prefer (I used refined sunflower oil) until both the paruppu turn golden yellow. Make sure to keep Sautéing it to avoid burning it. The chilli would also have started emitting its odour by now. Once done frying, keep this mix aside to cool down. Now, take the eLLu that is remaining and Sauté it on a pan without any oil. This has to be done dry. The eLLu will start to burst like pop corn. Be careful not to get burnt by the bursting grains. The raw smell would have disappeared by now and the colour would've also turned to golden-yellow. This indicates that it is cooked. Remove the pan away from the fire. 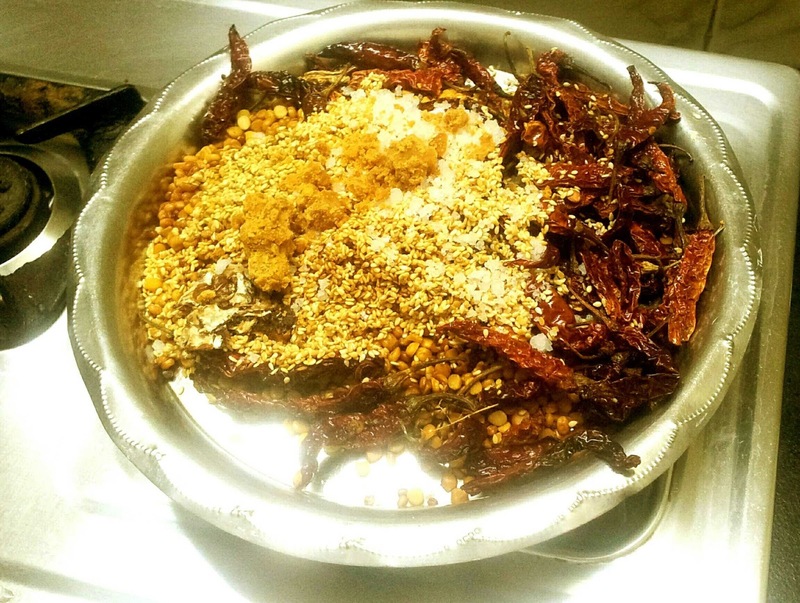 Now, take the previous mix of Red chillies, Kadalai Paruppu, VeLLai ULundhu and asafoetida, after making sure that it has cooled down sufficiently for your mixer, grind it along with a lemon-sized piece of tamarind and Rock-salt as necessary. (Rock salt lends a better taste than free-flowing powdered salt). Last step is to add the eLLu that has been cooling down all this while to the already ground powder and grind them all together. That's it. It's done. That was simple, wasn't it? Allow it to cool down and store it in an air-tight container. The measurements mentioned here will make the powder last for about a week for a single person, if used everyday. 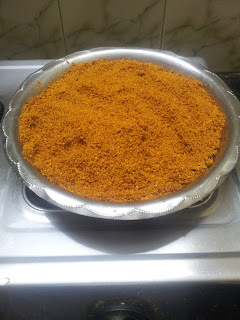 This can be mixed with rice, used as a side-dish for Idly, Dosai, Thayir saadham (Curd rice) etc. Let me know if you try this out and how it turned out to be. And if you have any tips/tricks in survival skills, leave it in the comments. 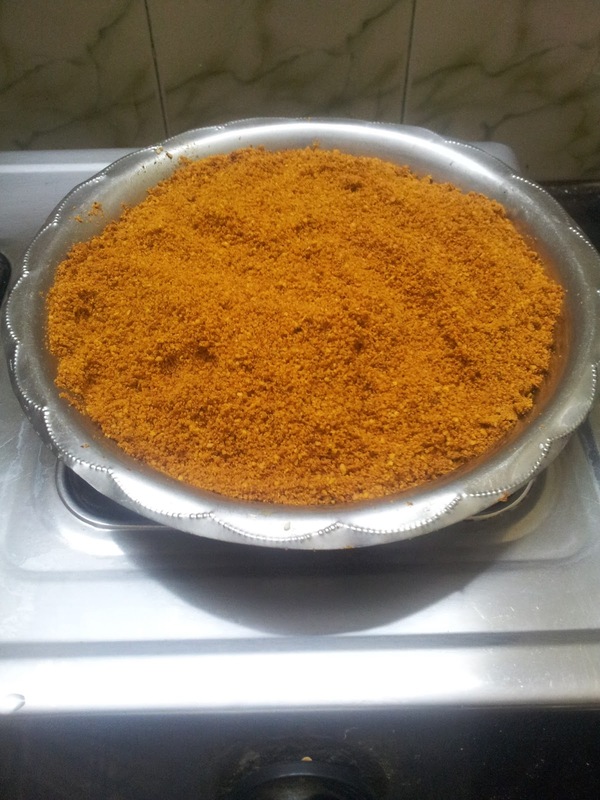 I will follow-up with posts on the recipes of Thenga podi and Dhaniya podi soon. Having read this I believed it was extremely enlightening. I appreciate you taking the time and effort to put this content together. I once again find myself spending a lot of time both reading and posting comments. But so what, it was still worth it!